Happy Makuhita Day to this guy! Whoooaaaaah, glad I checked the calendar- I thought Voltorb Day was the 19th! I got a typo to fix in my member post! But not just yet- first and foremost, happy birthday to Fortune, my level 10 Voltorb! Happy Litwick Day to one of my newest pokemon, Wisp! Wisp has grown from lv.50 -> lv.53. Wisp has learned MT Ally Switch. Wisp has learned TM Psychic. Wisp has increased All Contest Stats from 0 -> 10. Wisp has evolved into a Lampent! Wisp reacts to this Dusk Stone and has evolved into a Chandelure! I still need to recolor Pan's sprite whoops. A little late, but Happy Candlewax Day! Trainer Birthday Presents:[LIST][*]x1 Heart Scale[*]1,000 Pokédollars[*]x5 Rare Candies[*]x2 Mysterious Gummis[*]x1 any Pokéball (available in the Department Store)[*]x1 TM[*]x1 Magical Party Popper: The Pokémon who pops it will learn the move Celebrate! [*]x1 Egg of your choice:[LIST][*]Birthday Egg: Guarantees to hatch a non-legendary Pokémon within the player's Memakyu! Birthday time for one of the more battle-hungry Pokémon I got! Happy birthday to Scorpius, my level 52 Drapion! Mint yawned as a new day dawned on the Pearl Islet, though it wasn't the sun that had woken her this fine morning so much as a particular Skitty in her care. With the little nub of one of her paws, Snowy was intent on waking her Trainer up just a little bit earlier than said Trainer had been wanting to. Sitting up, stretching, and rubbing the last dregs of sleep out of her eyes, Mint looked down at the incessant kitten next to her, who quickly jumped down from her bed and disappeared through the cat door to the bedroom to head downstairs. Mint sighed as she looked at the time on the clock next to the bed, it was still 8 AM, couldn't Snowy have waited another hour or so? Then her eyes drifted to the date. At that moment, the sleepy haze surrounding Mint vanished as if plucked from existence. If she didn't get going, she'd be late! She quickly changed out of her nightgown into her favorite dress. Wildly getting together her bag, six of her Pokémon, and of course Sprocket (who yelped in surprise as Mint yanked him into her Bag with a "you can sleep on the way! "), she quickly got on her shoes and descended the steps to the boat faster than ever before. Untying the small craft and placing her bag in a cubby underneath the bow, Mint fired up the engine and was off for the mainland. She didn't want to be late for this! Docking in New Fizz City, Celeste, quite tired from keeping up with Mint's frantic pace, perched on Mint's shoulder with a light, irritated peck to her Trainer's cheek. "Oh, stop it, you needed the exercise!" Mint said, tying up the boat and retrieving her bag, from which Sprocket had apparently already wormed out, though he was still sleepy as he floated out. "Pick up the pace, Sprocket, we've got someplace to be!" Mint said, clearly more awake, alert, and enthusiastic than either of her companions. Deciding it would be easier to just stick in the bag for now, Sprocket returned to the pocket he'd been stuffed into earlier to let himself wake up, as Mint finished tying up the boat and broke into a run for the city proper. Mint came to a screeching halt outside her destination, the Birthday Bubbles Bash venue. Mint burst through the front door, greeted by a familiar face. "Dad!" she said, throwing herself into the man's open arms full force, sending them both back into the front counter. In the party venue, Mint's various Pokémon were happily gorging themselves on the food the venue provided and playing on the varied equipment-even Heimdall seemed relaxed and more focused on the other Pokémon than Mint, even if he was more grown up than the others. At the table, a festive ice cream cake (with chocolate chip cookie dough in it, Mint's favorite) sat on the table between Mint and her father as the two chatted eagerly (and quickly devoured the cake, as it wouldn't last the trip to Mint's freezer), Mint regaling him about some of her ventures in the region, like her trip to the New Year's festival and the Winter Market tree contest. "Anyway it's time for your gifts. Here's a Heart Scale, a little cash, a few candies for your Pokémon, a Surf TM for your Lombre, and, well, here's the big one..." he said, reaching down and pulling up what looked like an egg in wrapping paper. "Now, don't unwrap this yet, bring it over to the Hatchery and let them do it. I know you'll love what's inside, but I don't want to let the eggshell spoil it for you. They say it'll be ready about a week after you drop it off, alright? I'll put it back in the holder for you..."
After Mint's Pokemon had tuckered themselves out and the cake had all been eaten, Mint and her father left to drop off her Egg and have a day on the city together as father and daughter. Out of everything, this was the best gift she'd gotten. •	x1 Magical Party Popper: The Pokémon who pops it will learn the move Celebrate! ◦	The user is suddenly encased in a colorful gift box. The Pokémon cannot move while in it, but the box becomes an effective yet fragile shield and bomb, all in one festive package: opponents attacking the box will see their attack's damage reduced by 30% and, while destroying the box, triggers an explosion of confetti and ribbons which causes a small amount of damage. ◦	Birthday Egg: Guarantees to hatch a non-legendary Pokémon within the player's Memakyu! ▪	If the trainer has less than 8 non-legendary Pokemon in their Memakyu (or does not have a Memakyu), the egg will act as an Enigma Egg. ▪	Requesting shiny Pokémon in your Memakyu will NOT guarantee a shiny result. ▪	The hatched Pokémon can be of any species within the player's whole Memakyu, no matter how it is split (i.e. 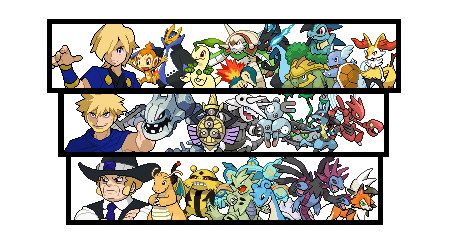 for different trainer characters). Using the Birthday TM to teach Surf to Kapp'n the Lombre, and the Magical Party Popper to teach Celebrate to Patches the Pachirisu. Using the 5 Rare candies to immediately raise Piper the Starly to Level 6, resulting in her learning Quick Attack. myahoo: Annabelle's birthday presents confirmed! Serverus Snope: Mochi's birthday presents confirmed! King Ghidorah: Yamask's birthday presents confirmed! lilbluecorsola: Patty Cake and Pan Cake's birthday presents confirmed! Last edited by OkikuMew; 09-14-2018 at 09:05 PM. Two birthdays in a row! Wow! Happy birthday to the first Fairy-type to join me- Cotton, my level 8 Slurpuff! A day late but happy birthday to my first enigma egg hatch, Trieu the Drapion! Trieu goes from lvl 41 to lvl 44! Wow, it feels like I was here just yesterday! Giving a happy birthday shoutout to my newly gotten Merengue the Level 1 Swirlix! Merengue grew to Level 4! Merengue learned Psychic via TM! Don't hold your breath, September isn't over yet! And since it's my birthday today, claiming the goodies above :3. TM is Dazzling Gleam, which I'm using on Custard the Togetic. Last edited by Lil'twick; 09-17-2018 at 08:39 AM. Missingno. Master: Cotton's birthday presents confirmed! TheKnightsFury: Trieu's birthday presents confirmed! Heather: Merengue's birthday presents confirmed! Happy Meditite Day! Here's Anjali's second set of birthday gifts! Level Up! Meditite grew from Lv. 4 to Lv. 7! New Move! Meditite learned Confusion! Birthday Poffin Used! Meditite's contest stats grew from Beauty 10/Cool 10/Cute 10/Smart 10/Tough 10 to Beauty 20/Cool 20/Cute 20/Smart 20/Tough 20! Birthday Gummi Used! Meditite's Bond has been raised from 3 to 5! A little late, but not too late! Happy birthday to Observe, my level 40 Medicham! Last edited by Missingno. Master; 09-23-2018 at 11:38 AM. Reason: Derped on Observe's initial Bond. Happy birthday Black and White. Time to close out September with a two-for-one deal! Happy birthday to Godric, my level 25 Nidoking! And last but not least, happy birthday to Rowena, my level 25 Nidoqueen! Last edited by Maskerade; 09-26-2018 at 03:35 PM. *being carried in by a very angry Incineroar* Please Morgana! I'm sorry I'm late to pick up Jean's presents! I didn't mean to! : *crossing her arms* Hit her again papa. At least let me pick up your presents first! ☆ Jean's bond goes from 1-3. Happy belated Nidoran day to Nidoqueen AND Nidoking! Gemini Spark: Anjali's birtdhay presents confirmed! Godric and Rowena's birthday presents confirmed! Maskerade: Nidoran ♂'s birthday presents confirmed! myahoo: Zephyr's birthday presents confirmed! Naru: Jean's birthday presents confirmed! King Ghidorah: Nidoqueen and Nidoking's birthday presents confirmed!